Floor Technologies, the poured floor specialists, are now also the spray foam insulation specialists! Whether new construction or renovation, Mark Cardoni, now of Floor Technologies and an industry veteran for 15 years, has the knowledge and experience necessary to tackle any insulation challenge, big or small. Mark is one of three spray foam installers in Minnesota certified by the Air Barrier Association of America and has been featured in Spray Foam Magazine. Floor Technologies values the reputation they have built in the Minnesota and Western Wisconsin region and chose to partner with the most reputable name in the spray foam industry, BASF. Spray Polyurethane Foam (SPF or Spray Foam), is derived from different chemicals. These components are sprayed at the same time from a specialized spray gun, mix and create a reaction which causes the foam to expand and harden. 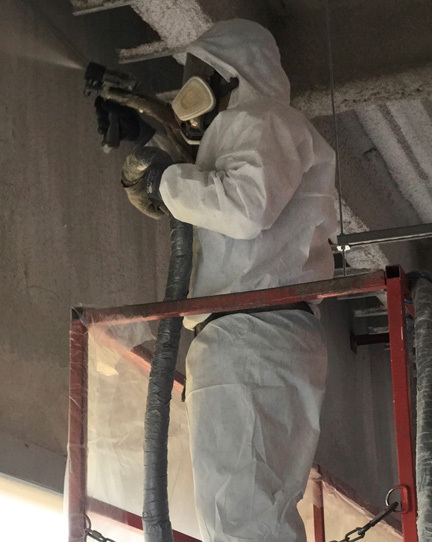 Because the mixture is sprayed and not laid, the normal risks associated with fiberglass or cellulose insulation are a non-issue. The spray foam mixture fills the nooks and crannies of the floor, wall or roof, providing an Eco-Friendly, energy saving alternative to hazardous historical insulation options, saving your home or business cost in the long run. Near zero air permeability – the expansive nature of spray foam allows an airtight seal and blocks exposed areas normally left vulnerable with other insulation options. Keeps out moisture – Because spray foam fills small holes or cracks in walls, floors or roofs that may not be covered by alternative insulation methods, air and thus moisture is deterred from entering the structure. Eco Friendly and promotes indoor air quality – because of the chemical make up of spray foam insulation, the risk of loose fibers becoming airborne is mitigated. It also reduces dust and the presence of mold and mildew in the home. Once installed, it provides a healthier environment without adding any emissions that can lead to allergic reactions. Long lifespan – spray foam has no food value for living organisms, and therefore will not rot, decay or break down over time.